It was an unexpected thing and I never expected it to be like this. Yes, I'm talking about my nails, silly! What else do you expect? I was cleaning my nails last Saturday and just accidentally stumbled upon this combination, which is kind of reminds me of Ursula from Disney's The Little Mermaid. Have you seen The Little Mermaid 2? There's Ursula's sister, Morgana, whom I don't like much. 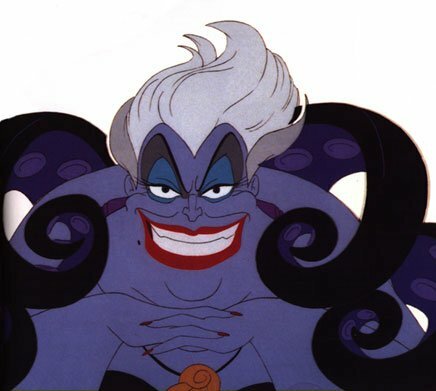 I still favor Ursula over Morgana. Morgana looks like the squid version of Cruela DeVille don't you think? LOL. Anyway, enough of the Disney characters chit-chat and let's proceed with how I've managed to come up with this simple and accidentally Ursula-inspired nail art. I don't have much nail polish now because I threw away some, which can't be used anymore so I'm just tarting to buy nail polishes again. I grabbed the SanSan Nail Polish in Metallic Lilac, which has a beautiful lilac color and isn't very opaque upon first swipe, but come the second swipe, you'll take notice of how gorgeous the color is. However, I wasn't very satisfied. I needed a twist on this beautiful yet dull-looking nail polish of mine. Another tip? Nah! I'm tired of tips but I can't do anything complicated right during that time because I was so sleepy. So, I grabbed the SanSan Nail Polish in Red Gleam and swiped a straight line in the middle of my nail. 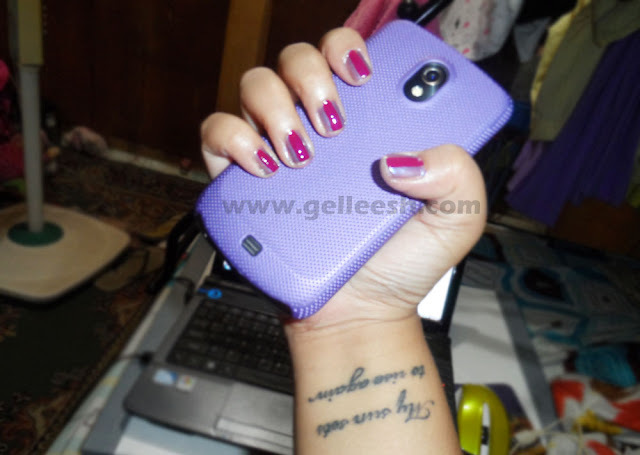 I felt like it made my finger nails look longer and although it's very simple, I still like it because of the twist. It almost appears a bit edgy compared to the girly look the Metallic Lilac gives off alone. So, while I was putting the pictures here in my laptop, it suddenly occurred to me that my nail art looks a bit like Ursula from the Little Mermaid. It reminded me of her. Do you agree with me? Okay, there's no picture of Ursula on my nail but she's the first one, who popped in my head. Can't name my nail art Squid-inspired instead, eh? hahaha! that happens to me noon. but once you get the hang of it, keri na!